When I received the call from Optomen productions in 2014 to discuss an idea that they had, I thought my fairy godmother was looking after me! My whole working career, from aged 18 when I was a support worker for teenagers with learning disabilities, has been about creating positivity around disability. I set up Social Enterprise Genius Within CIC in 2011 to address the lack of understanding, poor practice and lack of evidence-based solutions for workplace inclusion. Here was a team who wanted to find out more, and could do what I had been unable to do – change the narrative on a national scale. The first show, which won awards, was a triumph. Despite my nervousness that the cutting room would bias the program towards patronising sympathy or judgmental views on motivation (as we so often see in the mainstream media) the BBC2 programme held the balance beautifully. We saw the genuine struggles created by trying to fit in to a neurotypical, able-ist world, and the thwarted genius within. We also saw how individuals were able to flourish in the right circumstances with the right attitude and basic adjustments. Series two was a joy to make. We filmed much more of the journey. How does a person go from feeling hopeless and frustrated to competent and confident? It’s not just about positive assessment, but also about coaching, working with peers to feel less isolated, and practising new skills. This year’s contributors put their remarkably brave faces straight to the camera and told it like it is. They shared their heartache, their passion, their hopes and dreams. We owe them such massive appreciation for inviting us to see their vulnerability such that we might learn to respect them and be inspired, rather than feeling sorry for them or suggesting that they are failing because they aren’t trying hard enough. - When people constantly fail, they need to stop trying for a while to protect themselves. It’s called ‘Learned Helplessness’ and it isn’t the same as being feckless or indolent. Our large institutions value a small range of talent (literacy, numeracy, concentration and compliance) and anyone who can’t do all four is a ‘failure’. - The antidote to Learned Helplessness is HOPE, not chastisement. - Hope can be provided by reducing isolation, providing person-centred adjustments and coaching, as well as positive assessment of abilities. - Blaming individuals for their own demise lets the rest of society off the hook. It’s not fair. For the want of a few simple adjustments, some flexibility and less embarrassment over asking straightforward questions we could all be disability confident at work. - Disability benefit policies that mean people have to constantly be assessed to prove how ill they are, so that they can keep basic social safety net provision, are counter intuitive to 50 years of evidence based psychological theory. Some organisations are doing amazing things. The DLR team offer support for people with mental health needs wanting to reintegrate into the world of work with supervised walk throughs of their public transport network. Several major banks that I work with provide speech-to-text software for any employee who needs it, and they don’t wait to be asked. It’s easy if you try and you can be rewarded by loyalty. 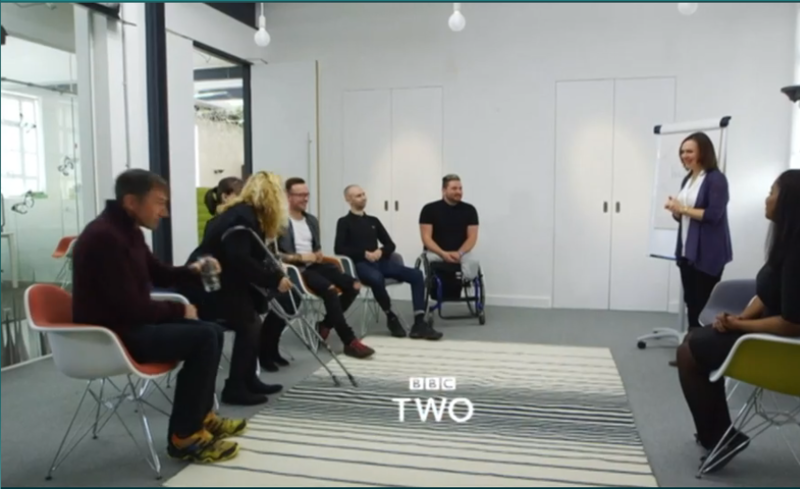 Employable Me 2 shows how dramatic the changes are for people who are given a chance. Watch the programme now via BBC iPlayer. Find much more about Nancy Doyle and her work in our archive. We also asked Nancy some additional questions. In supporting the jobseekers, how much are you relying on your psychological background and how much of it is about practical tips from the world of recruitment? In terms of psychology, I am relying on social cognitive learning theory. We know that through a bit of knowledge transfer, role modelling in peer groups and vicarious learning we can create the conditions for mastery experiences. This is why the group workshops are more powerful than 1:1. They also address the issues in social identity – unemployment is isolating, disability is isolating, by bringing people together we give them a chance to develop a new social 'in-group' where they can feel welcome and empowered. Accessing the hidden job market access by direct calling was based on my many years in unemployment support and recruitment as well as some basic psychology. Employers can recruit for skills and experience, but how do they know if you are committed and tenacious? If you are cold calling and not waiting for a job ad you have already proved something about your personality that is hard to screen for in interviews, assessment centres or CVs. To what extent is the process influenced by being on TV? Is there a risk of raising false hope for people in this position who don't have the force of the BBC behind them? Actually in many ways the TV made it harder. Many employers were resistant to the idea of being on film, they thought it might be a risk to their reputation. In our work at Genius Within CIC we are regularly exceeding employment outcome targets set by the DWP and the Ministry of Justice. In episode 1, Andy and Ryan were the stars, but I think you could say that the employers are the stars too - however much you focus on strengths, it's also quite something being prepared to take on those risks. Employers are more and more open to the idea that disability is an untapped talent resource. We need to do our part as occupational psychologists and research reasonable adjustments so that employers know what to do. There needs to be a clear link between performance difficulties, reasonable adjustments and career success and progression. We need to stop research diagnosis and start researching intervention evaluations.